Legendary Austrian filmmaker Fritz Lang’s 1956 newspaper world set thriller was his penultimate American film. Lang, whose mighty filmography (both sides of the Atlantic) included stellar masterworks Metropolis (recently restored and reissued) and The Big Heat was on his uppers by this point and reduced to working as a studio gun-for-hire rather than instigating the prestige projects he once did (and as Hitchcock was doing at this time). 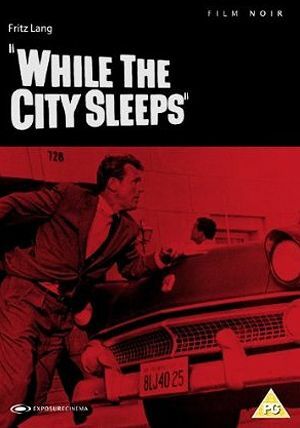 But don’t be fooled – While the City Sleeps is classic Lang. Three newspapermen (George Sanders, Thomas Mitchell and Dana Andrews) attempt to track down a notorious sexually-motivated serial killer in an attempt to impress their new boss (Vincent Price) and take control of the newspaper. Langian themes of technology, change, and hierarchy and media hysteria saturate this seemingly straightforward B noir to powerful and oddly relevant effect. This digitally remastered, extras-heavy reissue is well worth seeking out.